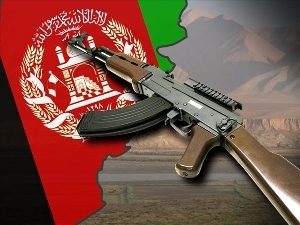 A turncoat Afghan soldier shot and wounded five US soldiers today in eastern Afghanistan. An Afghan soldier opened fire on a group of American troops, wounding five of them, Western and Afghan military officials said Wednesday. The attack, which took place Tuesday in Wardak province in eastern Afghanistan, was the second incident of its kind in three days. On Sunday, an Afghan policeman shot and killed three British soldiers. The phenomenon of “green-on-blue” shootings, in which members of the Afghan security forces turn their weapons on Western troops, has become a serious concern in recent months. At least 26 NATO troops have been killed this year in such attacks. Afghan officials said the shooter, a new recruit to the army, fled after the shooting, and authorities launched a search. NATO’s International Security Assistance Force said the incident was under investigation. The attack took place at a checkpoint in Wardak’s Sayedabad district, said Afghan army Gen. Abdul Raziq, whose area of command includes Wardak. In August of last year, the district was the scene of the biggest one-time loss of U.S. lives in the war, when 31 American troops, most of them elite Navy SEALs, died after an insurgent managed to shoot down their Chinook helicopter. UPDATE: 70% of U.S. Military Fatalities in 11-Year Afghan War Have Occurred on Obama’s Watch.